Washington State was named the second best state in the country for genealogy in Family Tree Magazine (May 2009). Massachusetts came in at No. 1, thanks to its Mayflower passenger list and the New England Historic Genealogical Society. The Digital Archives got a well-deserved nod in the just-on-newsstands edition of Ancestry Magazine, which put out its “most Wired States of America” rankings and gave the Evergreen State the top spot for online genealogical records. This really comes as no surprise to Sam Reed – our State Archivist tells Sam Reed we have more than 80,000,000 records – yes, 80,000,0000 – on the Web that the public can click through to dig into their past. If you haven’t seen or visited the Digital Archives, do it virtually 24/7 at http://www.digitalarchives.wa.gov/. This program – which makes millions and millions of important records, photographs and thousands of audio recordings available instantly – is the first of the kind in the country and is now a model for other states wanting to preserve records electronically. Other states that got thumbs up by Ancestry Magazine for their online genealogical records searches included Missouri, Illinois, Nevada and Pennsylvania. 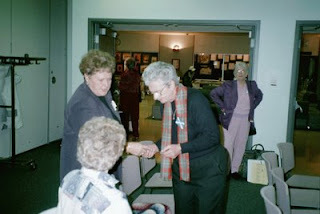 Picture taken at 2001 October Seminar at Spokane Falls Community College. 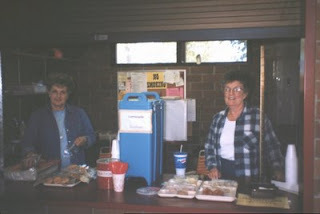 Longtime EWGS member, Mel Butterfield, passed away last Wednesday, February 11th. His funeral will be held on Tuesday, February 17, 2009 at 1:00 pm at Heritage Funeral Chapel. I highly recommend reading Mel's obituary in the Spokesman-Review here. He had an amazing life, and I know he will be sorely missed by his family, friends, and fellow EWGS members. 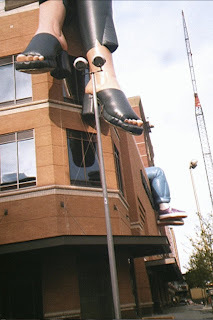 This is a picture of a building close to the downtown library when it was under construction. What store occupies this building now? Hint the skywalk from the library connects to this store. I was not planning to write a article for this Carnival of Genealogy, since it has been years since I had a “Happy Dance” on my genealogy. 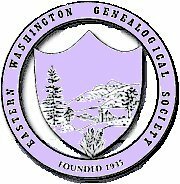 I do the research for EWGS and have had many “Happy Dances” for others I have helped over the years, but today I got a phone call from a gentleman in Springfield, Missouri asking about my Kelly family, and that he was a grandson to a brother of my great grandfather Robert Forsyth Kelly. He was wondering where I got all the birth and death dates I had in my Kelly family. I got them from my grandfather's bible which I still have. He found me through the “Yellowjacket” the newsletter of the Great River Genealogical Society of Quincy, Illinois. This newsletter covers all of Adams county Illinois and Robert Forsyth Kelly's grandfather Robert Forsyth settled near Ursa in Adams county Illinois on a War of 1812 bounty land that he purchased. Robert Forsyth had been in the War of 1812 in the battle of Detroit under William Henry Harrison. The gentleman was hoping to find some information on Robert Forsyth Kelly, as his grandfather was Charles Bryan Kelly and a brother to Robert Forsyth Kelly. He says he has some pictures of Thomas and Margaret Kelly the parents of Robert and Charles and proof that they had ancestors in the Revolutionary War. I think I already have that information, but he says his includes pictures. The booklet I have says it is part of a larger book which I have never been able to find and my booklet does not have any pictures, so I am hoping he has this book. He says he is mailing me the copies tomorrow. I have a picture of the Forsyth house in Ursa, and an account of the War of 1812 battle Robert Forsyth took part in to trade and quite a lot about the descendants of Robert Forsyth Kelly. Although Robert Forsyth and his wife are buried in the cemetery in Ursa on land donated to the church by Robert Forsyth, their daughter married Thomas Kelly and Thomas Kelly, his wife Margaret, and sons Robert Forsyth Kelly and his three wives, and Charles Bryan Kelly and his wife Laura are all buried in a cemetery in Trenton, Missouri. After Robert Forsyth Kelly died my grandfather gave Charles Bryan Kelly money for a stone for his dad, but when we visited that cemetery a few years ago only Charles and Laura Kelly had stones, so we paid the caretaker to get and place stones for Thomas, Margaret, Robert Forsyth, and the three wives of Robert Forsyth. That makes six graves and the caretaker said Robert bought eight plots. Charles and Laura are not buried close to Robert so I guess they got their own plot. The only other person we could think might be there was my grandfathers brother, he died at age three and so my grandfather was almost an only child. We never found an obit for his brother, nor proof he was buried there, but placed a stone anyway. The caretaker sent us some nice pictures of all the new stones, and I really want to get back there some day to see them in person, My grandfather Charles Rupert Kelly was born in Trenton, Missouri as was my mom, and I was named after both my grandfathers Charles Michael Hansen, Michael from my other grandfather Anton Michael Hansen. Anton's father was Hans Mikkelson so Michael was also from my great grandfather and great great grandfather Mikkel Madsen.